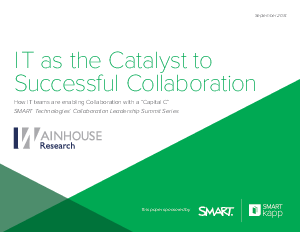 Enterprises have historically asked IT to drive Collaborative technology into their organization. The supporting solutions have evolved over the years, from simple, expensive, audio conferencing platforms to more feature-rich audio, video and web collaboration found in today’s integrated unified communications (UC) platforms. At the same time, most IT teams are faced with increased costpressure – in fact, many IT executives note they are actively deciding what NOT to spend money on, vs. selecting the best technologies to invest in. The end user has also evolved over this time - with today’s Millennials possessing more technical savvy and digital aptitude than most Baby Boomer and Gen X end users. These changes are converging into a perfect storm, creating an untenable environment for the average IT team. This begs the question: How can IT become an asset in transforming an organization’s ability to embrace Collaboration with a capital C? This paper is the third in a series of publications that explore the insights gathered from the SMART Technologies Collaboration Council. The Council is comprised of collaboration champions from some of the most successful multinational organizations in the world, representing a diverse set of industries across finance, technology, academia and more. In this piece we summarize the Council’s views on IT’s role in enabling Collaboration with a capital C, including best practices and key actions an IT team should consider.